AEE SoCal is pleased to welcome you back to its biggest event of the year. Join us at the 2019 Annual Conference on Wednesday, September 19, 2019 at the SoCalGas Energy Resource Center in Downey, California. This is an all-day event that you don’t want to miss, providing a deep look at timely topics in Energy Safety, Security, and Sustainability. From wildfire mitigation in California to cybersecurity on a global level. Every year, AEE SoCal brings together an audience with a wide variety of individual perspectives and roles in the energy industry including executives, managers, engineers, policymakers, regulators, project developers, and finance specialists. This is a fantastic opportunity for professionals, students, and all with an interest in energy to connect and learn from one another. 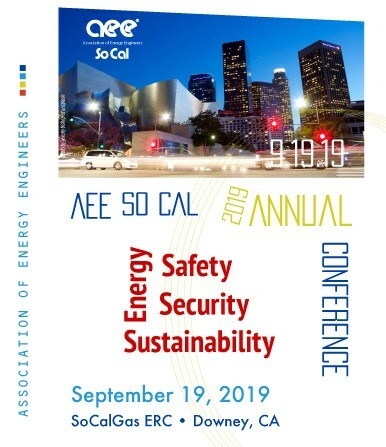 AEE SoCal is a Section 501 (c) (3) nonprofit organization that provides year-round educational opportunities for energy professionals, students, and the community. Thank you for making the 2018 Annual Conference a great success for all. Let’s do it again this year, 2019!